I'm back today with Part Three of my epic battle with Sample Mountain, sharing six more samples I've used along with my thoughts on each and whether I'd shell out the cash for the full-sized products! I do like sample sizes for trying out products I maybe wouldn't have otherwise, but find I have a nasty habit of saving them up in my bedroom drawers/bathroom shelves, meaning I have stacks of the things I need to shift! PhytoCare Papaya Ointment This is a really thick ointment with a slightly odd fruity scent which is aimed at extremely dry skin; as an eczema sufferer, that's me! I tended to use this of an evening before bed, as I found the ointment sat on my skin leaving it slightly sticky rather than fully sinking in, but I don't mind that so much given that it did also do a fantastic job of hydrating dry bits on my elbows and cuticles. It's also quite nice as a lip balm! That said, I don't think I'll buy the full-size of this because I have so many similar products. Erno Laszlo Morning Beauty Rescue I used this as a kind of serum under my moisturiser and again, I really liked using it, finding that it brightened my skin really nicely, although it did leave my face feeling slightly sticky. Looking on their website now, it turns out this is meant to be used as more of a primer - whoops! I've not heard of Erno Laszlo previously so I'll be looking into the brand a little more having tried this sample, although I'm not sure that this particular product is one I'd repurchase. Jergens Ultra Healing Body Moisturiser Yeah this wasn't for me at all, probably due to the presence of Petrolatum and Paraffinum Liquidum in the ingredients list, both of which I've previously identified as ingredients which dry my skin out. That's exactly what this "moisturiser" did to my legs, so it's not one I'll be buying in the future! La Roche-Posay Redermic R Dermatological Anti-Ageing Corrective Concentrate I'm not 100% certain whether I'm cheating by including this as I have previously done a dedicated review post on it, but hey, it's a sample and I've finished it so in it goes! As I said in the aforementioned review, I don't feel like a sample this size is enough to get a good idea of whether this type of product works for you, but I've enjoyed using it nonetheless and would consider a full sized purchase at some point down the line. Vichy Idealia Life Serum Again, I've been using this serum of a morning under my moisturiser and have actually really like it; a sachet this size contains about four uses, so a full-size would go a long way! It was lovely for brightening my skin and gave a great base for my make-up, so this is something I'd consider splashing out for. Yves Rocher So Elixir Purple A Glossybox sample, I adored this fragrance; it's sweet and slightly fruity which is my absolute favourite kind of scent. Don't ask me about notes and such because I have no idea and I'm generally dreadful at describing perfumes, but this was gorgeous and one I will almost undoubtedly be buying in full-size at some point. 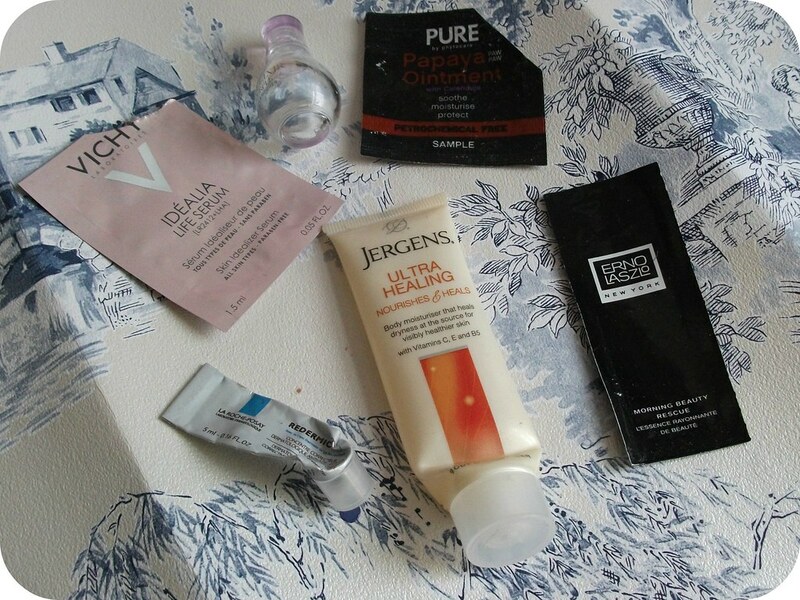 So, that's six more samples down in my quest to rid my house of tiny sachets of product! Have you tried any new samples recently? What are your thoughts on sample-sized products?